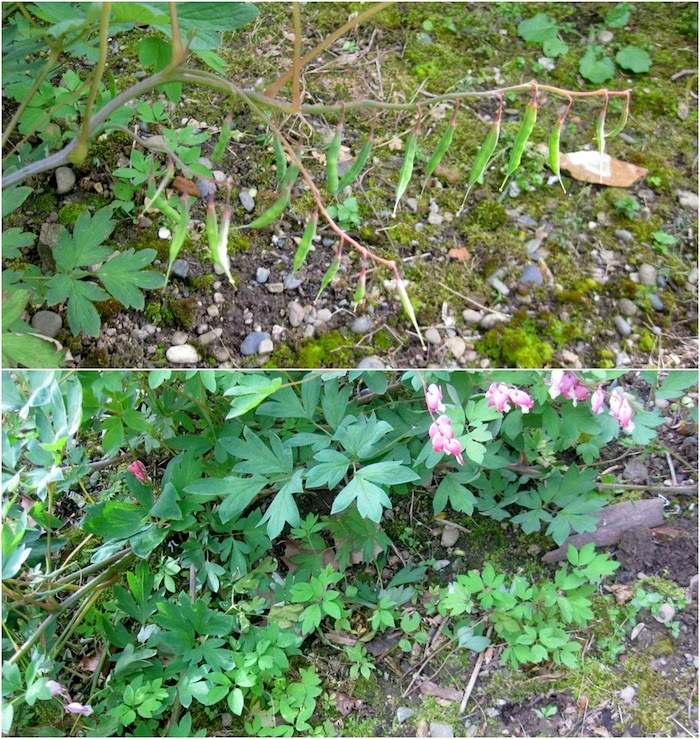 My first dicentra, the one that adorns the wall of this blog, is not a dicentra anymore! Its called Lamprocapnos spectabilis. What an ugly name for a beautiful plant. It’s those damned botanists again! I refuse to use that horrible word again today! The highest horticultural authority in the land describe it as a rhizomatous perennial but its subterranean structure looks like a root to me! They also say that it can be propagated by root cuttings. They seem to want it both ways! Whatever the world calls those underground structures they have never rooted for me! I used to examine for a national horticultural examination and in a question on root cuttings I was universally told by the unfortunate students that Dicentra spectabilis could be propagated by chopping up roots. How could I mark them wrong when all the books sing to the same tune! Root cuttings have two important characteristics. One is that they should be roots! 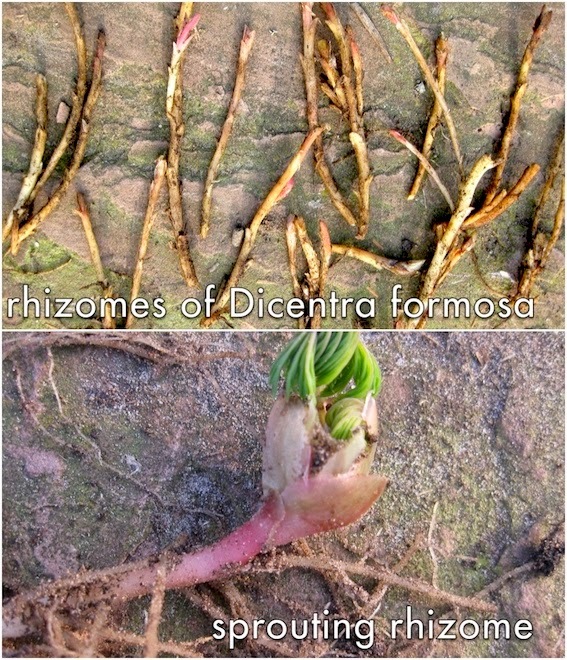 The so called root cuttings of that other popular dicentra, Dicentra formosa are not roots, they are underground stems called rhizomes. ‘Common knowledge’ dumbly repeated by all the media says that this dicentra is propagated by root cuttings! Don’t get me wrong pulling the couch-grass-like rhizomes apart in early spring is a wonderful way to propagate Dicentra formosa. I used to divide hundreds in February and March directly into small pots to sell on my Open days as lovely plants which would be in full flower a month or so later! The second characteristic of root cuttings is that they can initiate new buds on the cut pieces. Roots on the majority of plants do not have buds on their surface and are generally unable to generate new ones. A few plants do have this special ability as you may very well know to your cost in the case of dandelions. Dicentra spectabilis roots (as I claim them to be) do not have this much vaunted ability to make new buds on cut pieces. The fanged roots certainly have terminal buds and subsequently shoots at their apex and as long as you take a piece with at least one bud it will grow. This is the normal way it is propagated, it’s an example division! They are NOT root cuttings. I have tried getting cut pieces of spectabilis root taken without their natural terminal bud to grow many times. I always fail! An interesting analogy to the roots of Dicentra spectabilis are the root tubers of dahlias. If dahlia tubers are to successfully grow they must also have their terminal buds and you cannot chop them up like the stem tuber of a potato. These are one year old Dicentra spectabilis seedlings. You can clearly see where the stem gives way to a developing taproot. When it matures new buds can only form on the stem. You might expect someone who holds the National Dicentra collection to have fabulous plants. You would be wrong and although they are very easy to grow and my own are adequate, survive and look lovely, they are not as good as the best I have seen. The most magnificent I know have been in Belgium and France. Our maritime climate here in the North of England is so cruel. We get warm periods when new growth bourgeons and after a few weeks of benign conditions suddenly we get a series of sharp frosts. My bleeding heart is broken every year! 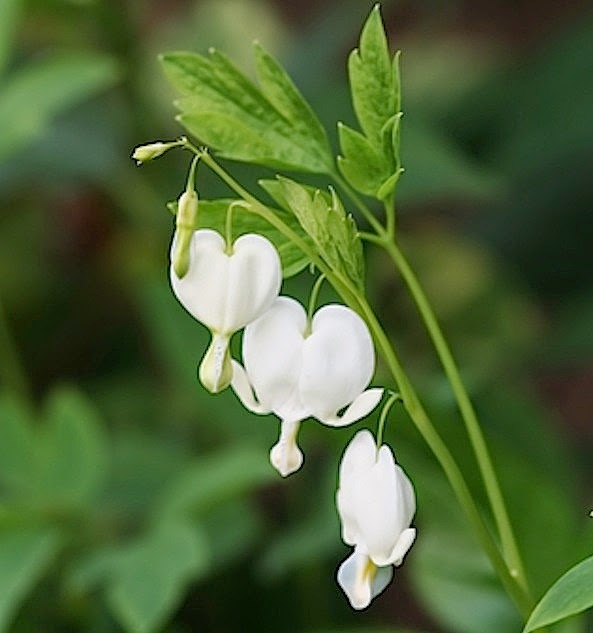 Some of the varieties such as Dicentra spectabilis alba and the cultivar ‘Gold Heart’ are particularly sensitive to sudden cold. Even if I escape frost damage, cold dry biting winds are a problem. It is very important to position plants so that as far as possible they avoid such constant checks. In those climates where severe Winter cold stops and Spring follows without changing it’s mind, Dicentra spectabilis thrives! Photographed in a neglected garden in Toulouse. Without any attention whatsoever this has made a fine plant which has set seed and germinated new seedlings. Brenda potted-up some of the seedlings for her son, garden owner Peter! 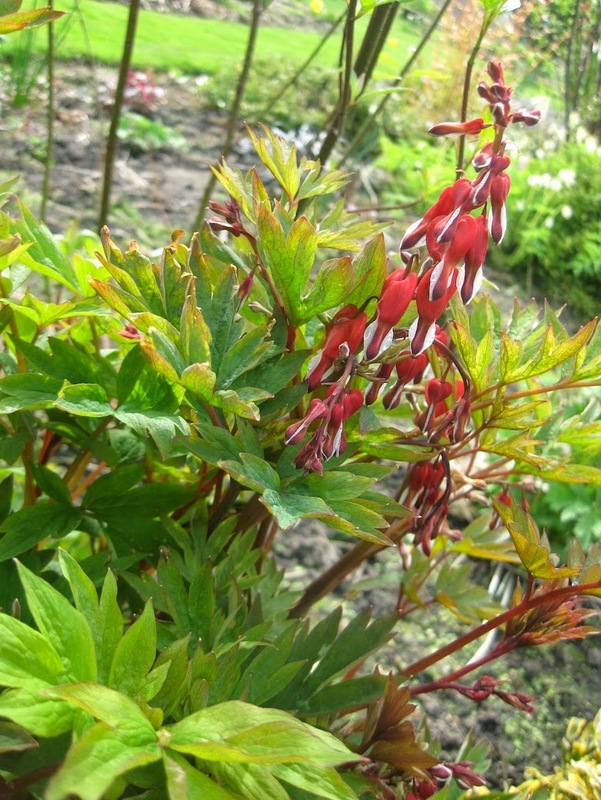 Despite the above proviso about wind and late frosts, Dicentra spectabilis is very hardy and tolerates a wide range of soils. It prefers deep well drained moist soils but is surprisingly tolerant to inferior drainage. It thrives in quite heavy shade but will also grow in full sun providing their is ample moisture. The best places are protected from wind and in light shade for a part of the day. If your dicentra thrives do not faff around lifting and dividing it every few years like the books say. I had one in Bolton Percy in the same place without any disturbance for about twenty years. I have sometimes bought new plants for clients at the Garden Centre and they usually survive but I don’t guarantee it. Plants raised in soft conditions can succumb to all manner of ills. The basic form from seed is the true breeding species D.spectabilis. When raised from seed I cannot discern any appreciable variation between plants. It is the first dicentra I owned. Dicentra spectabilis alba is the basic white form, strictly a sub-species, also comes completely true from seed. A fine specimen in Oxford Botanic garden. I hope they remember it’s there when they fluff up the soil! Dicentra spectabilis ‘Gold Heart’ has on a good day lovely golden foliage. On a poor day if you are feeling a little jaundiced, it is rather insipid and somewhat chlorotic. It’s rather a matter of opinion. It seems unbelievable now but I bought mine at Homebase when I was participating in a staff training programme twenty years ago.The garden centre supervisor told me that it was so chlorotic, she thought - probably correctly - that it had iron deficiency and had considered sending it back. I could not believe that I increased my National Collection at Homebase! I was intrigued four years ago to see a new dicentra, Dicentra spectabilis ‘Valentine’ in Parker’s wholesale catalogue. I just had to buy some. As is their fashion as a bulb suppler they sell it as dry roots, (wrongly called rhizomes elsewhere). When my plants arrived I was amazed and surprised by the quality of the sturdy roots and the strong terminal buds. I potted them up and even in their first year they made made very fine plants. ‘Valentine’ with its sound reliable constitution and beautiful colours is now my favourite. Have I found a new variegated variety? No. Sometimes in cold weather early growth temporarily shows this effect. I suspect it is caused by a latent virus which may or may not be significant! As already mentioned spectabilis and spectabilis alba come true from seed. As is often the case with hardy perennials it is best to collect your own seed. I usually sow mine in January in my unheated greenhouse. I am not quite certain whether it has a cold requirement, but cold certainly does not do the seed any harm! All the forms of Dicentra spectabilis are best and most easily propagated vegetatively by division. If you want maximum numbers from your plant tease the fanged roots apart and pot-up each one individually. If you are really confident you can sever the root fangs vertically and providing each has a terminal bud they will potentially grow. It’s not completely essential, but you will have most success if you can give them early protection in a cold greenhouse or frame. A much later set of divisions in early April. Despite the unpromising pieces now in June they have made very strong plants. By far the easiest way to propagate is to divide clumps with a sharp spade when you can see young shoots clearly emerging. Avoid slicing the shoots, but basically take a spadeful and replant direct in the ground elsewhere. In the past I have successfully rooted stem cuttings of Dicentra spectabilis. The shoots take quite a long time to root and if propagated late the natural late summer dieback comes before they are strong enough to survive. Unless you have a nurseryman’s precision I don’t recommend this method. The ideal way is as a specimen plant with plenty of space to itself in a slightly shaded, sheltered, well drained, moist woodland glade. There is a place in most gardens where similar conditions can be simulated, perhaps near a fence in a more shaded part of the garden but not too near vigorous trees or a leyland hedge with their severe dehydrating roots. As you will see from the pictures I grow some in large tubs. Although I can ensure my tubs are sheltered from severe biting winds and maintain my collection by overwintering in the cold greenhouse it is not necessarily the best way to grow them. They will only be worth displaying for three or four months. The benefit of the winter greenhouse is that the dormant roots can be kept fairly dry. I have lost pot grown dicentras in pots when the drainage has been suspect during periods of heavy rain. The achilles heal of Dicentra spectabilis is it dies down very early, frequently before the end of August. Woe betide any foolish ‘digger-overer' who forgets they are there! I have recently been trying to exploit this early dieback characteristic by sharing space with other plants that grow at different times in the year. My summer herbaceous borders are six or seven foot high by late July but are generally very bare until mid June and even then there is not a complete canopy of shade for a few more weeks. I have taken to mass planting spectabilis over these borders for Spring interest. It seems to be working. Later in the Summer they will be overgrown by the tall perennials but will have built up enough strength to do well next year. Another example of sharing is amongst my coloured stemmed shrubs that I cut down in Spring to stimulate strong shoots for winter interest. I have permanently interplanted the dicentra with my cornus whose stems provide a little welcome Spring shelter before being cut to the ground in the first week in May. The dicentra then have space to themselves until the new dogwood canopy thickens. The commonest common name for Dicentra spectabilis is ‘Bleeding Heart’. Much nicer is ‘Lady in a Bath’ and if you turn an individual flower upside down you can see why. I see a rather pulchritude Victorian lady standing in her tin bath by the fire! Perhaps I have a rather fevered imagination. Early in the days of holding the National Collection, I thought I had found a new variety in a Dutch catalogue. It was called ‘Coeur de Marie’. I subsequently found that this was the french common name. I am a quarter millionaire! I still make mistakes by forgetting plant names. A week before flowering I still thought this was a weed! I only discovered its name today! When someone downloads me on the two hundred and fifty thousandth occasion this weekend, they will not get a banner announcing a prize! They might not even notice or much more likely find themselves in the wrong place and leave in despair. I wonder how many people boost my statistics by pressing the wrong button several times? There is much about Google analysis that I don’t understand. Turning to it several times a day is some kind of affliction! Why does an obscure post unvisited for weeks suddenly flair up into several ‘hits’ in an hour! I am immensely grateful anyone calls at all! all those gardeners who know you will want to read what you say! It does not matter that you can barely string a sentence together, never use a camera, your writing is illegible and you are over-opinionated and somewhat verbose. But keep it short"
It has not quite worked out that way! Nearer the truth was when we were entertaining my former colleague Mike and his wife, Open-day gardener, Isobel, last week. I tentatively enquired whether they visited my blog. They told me about their busy lives and assured me they would look at it soon! I have been going almost two years! At least I can make rude comments about my friends - and even Brenda, and know they won’t actually read them. 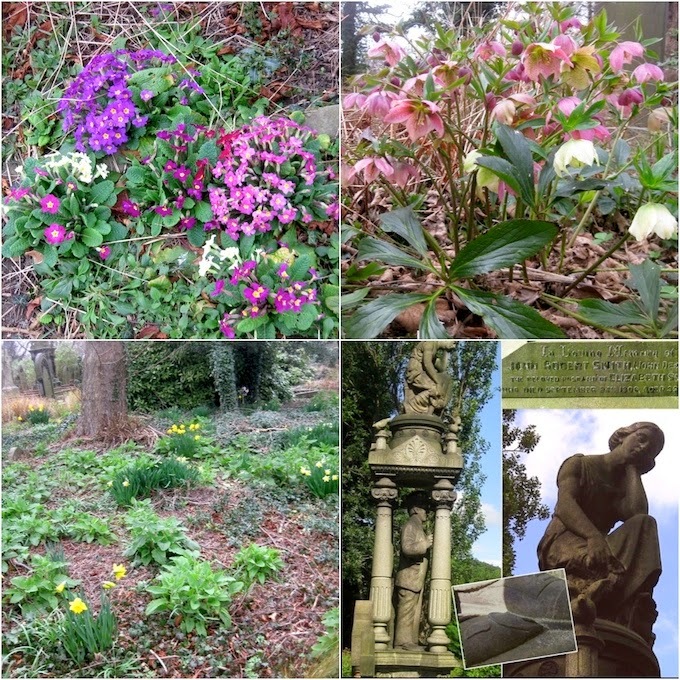 I have written a lot about Bolton Percy churchyard. When I looked through the gate yesterday it looked lovely but I had forgotten my camera! When I went through the gate to my horror it was overgrown with seven week’s weeds! My only previous attempt at writing was when Katherine Rhodes stopped her bike and talked me into writing a monthly gardening article for the Bolton Percy parish church magazine. It would not matter that I was not one of their flock! I shared my thoughts for the next twenty years! I have to tell you I never had a question, comment or query. I imagined that if half a dozen souls read me and perhaps a dog ate me, I was doing very well! Much to my surprise when doing a local ‘Gardeners Question Time’ back in the village last year someone said “I remember your piece on moss control and the witches brew you made in your bin”. There must be something about iron sulphate and moss. When I wrote my most read post, hardly anyone read it at all and I was chastised. “How could anyone who loves worms as you say you do, use that stuff”. I had mentioned that to a small extent iron sulphate deterred casting worms. I should have explained that the majority of worm species are completely unaffected and the casting types migrate to my borders. I have subsequently provided plenty of evidence of my high worm population with pictures of mountainous mole-hills in my lawn! I originally tried to be brief and might have sometimes missed out relevant detail. Not anymore! That post has now been read 20,000 times. An order of magnitude more than any other. There are probably 19,990 of readers who have read nothing else I have writ! That post showed me how people find information they want and many now know how on an old blog they can still ask questions that will be answered. Ever since writing the post about moss I have tried to find titles that search engines find! Many of my former titles are not Google friendly. I thought I was clever to come up with ‘My slimy friends’ for a post about slugs. I thought this post was a useful contribution that emphasised how gardeners can use slug pellets safely and I discussed the important concept that organic litter might be a preferred food to a slug than a hosta. The post has been read several times but not as much as I had hoped. I should have called it ‘Control of slugs’. Cathi suggests I go back and edit some of my titles. I have run a few continuing themes such as my series about glyphosate. I have sprayed glyphosate over forty years and I have had numerous disasters that others can learn from! I seem to keep repeating the phrase “you will not read enough to be completely competent by reading one post”. I intended my earlier post ‘Batting for glyphosate’ to make the a case for using “Roundup” in a garden and how I consider, despite popular opinion, that it is soil and wild life friendly. Far greater than those methods of garden management that involve continuously stirring the soil! I feel a more combative post is due, there is a lot of contrary opinion. I have written numerous posts about the rich wildlife in my gardens and how my plants grow well because of minimum cultivation which is in enabled in part by using glyphosate. Part of my three acre ‘garden’ at Worsbrough is really a wood! 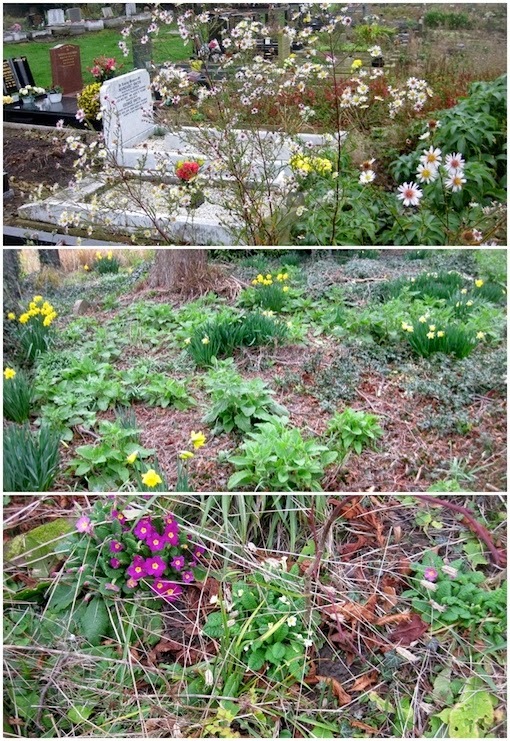 I normally do not show you my garden eyesores. I had not anticipated writing posts about wildlife and had not recognised that Harry next door was the most brilliant wildlife photographer I have known. Harry and Cathi had a fund of knowledge which they freely shared with me and my early posts such as those about the sparrow hawk and the crested newts were popular and gave me a degree of credibility. I personally enjoyed researching ‘Cuckoo love’ and the amazing relationships between this bird and its hosts. I keep reading more about this fascinating bird and recently added an addendum about its parasitic lifestyle ascending to symbiosis. I actually took the picture of Cathi’s lamb myself! Cathi continues to share with me her huge resource of Harry’s photographs. I was quite disappointed with the audience to my most recent animal post, my Christmas Day offering, about raising rheas from chicks. Harry’s pictures were absolutely astounding. The post had very few readers, perhaps people have other things to do on 25th of December? It is now more than a year ago that Harry died. My posts ‘BPTA-2830’, ‘Harry’ and ‘Harry Poole pictures: a picture of Harry Poole’ are all in their different ways my tributes to him. He was the most enthusiastic driver of the development of my blog and he kicked me from pillar to post when it did not reach his own high standards! My gratitude remains and is recognised in that his name still appears in the contributor’s column. I am now starting to wonder….that interesting name starts Har…. No, I must be wrong in my suspicions, Harry could have never spelled ‘grandiloquent! My post about amaryllis lily shot up in its first week to 600 and has never been read since. In contrast no one read the one about corn marigolds which languished on 66 for a year until it suddenly took off and its score is now several thousands! I just can’t figure these things out! I thought I might re-examine my very short corn marigold post and write a new one. That was before it’s near vertical ascent to stardom. I am pleased that in that new post, I promoted my opinion that none-native garden plants have a great deal to offer British nature if they are planted as I do, at the edge of farm fields! I considered herbaceous perennials as potential providers for bees in ‘Nectar guide’ and ‘Flight of the bumblebee’. To a small extent I returned to the theme in ‘Musings from York’. I am delighted that the recently published four year RHS trial confirmed my opinion that there is a place in the countryside for none native plants. Ironic that the previous day the popular press had been making hysterical comments in response to new legislation about so called alien invaders. When I described my pet honey fungus in my garden I conceded that my lilac would probably die! This morning’s picture says I was wrong! My least read two posts that languish below a hundred, were promotions for two very fine blogs! Anyone who listens to Doctor David Grimes will almost certainly lengthen their life. Anyone reading my son’s Dr. Who blog will shorten it! Writing a blog gives me a great deal of pleasure. It has made contacts with people from all over the world and I think off many followers as friends. My life changed in two ways in June 2012. I started blogging and we acquired a love bird. Poppy now flies around the house with complete freedom all day and now rules our roost! I have two masters now! I stopped at a local Garden centre for a coffee last week and was astonished to see a Roundup promotion displayed under the banner ‘Rapid action weedkiller’. Was the manager ignorant of his product or subtly hiding the truth without actually lying. It then struck me that within the deception they hid a great truth. You may very well remember a few years ago an advertisement for a paraquat based herbicide that favourably compared their product by quite rightly claiming it is much quicker than glyphosate. They showed parallel weedy strips of a long garden sprayed with these two very distinct - and actually incomparable products. Paraquat works by a contact action and if the sun is shining rapidly kills the leaves and green tissue. Glyphosate is translocated from the leaves to the roots and thereby kills the complete plant, but it does take much longer for the leaves to die. No doubt the advert actually showed a pure stand of annual weeds, a very unlikely occurrence in most gardens where a mixture of different types of weeds are more usually the problem. The advert showed paraquat killing all the weed by the next day, but in the glyphosate sprayed area there was no effect whatsoever several days later. This clever advertisement correctly confirmed that glyphosate is slow! It did not of course clarify that paraquat does not kill established perennial weeds. 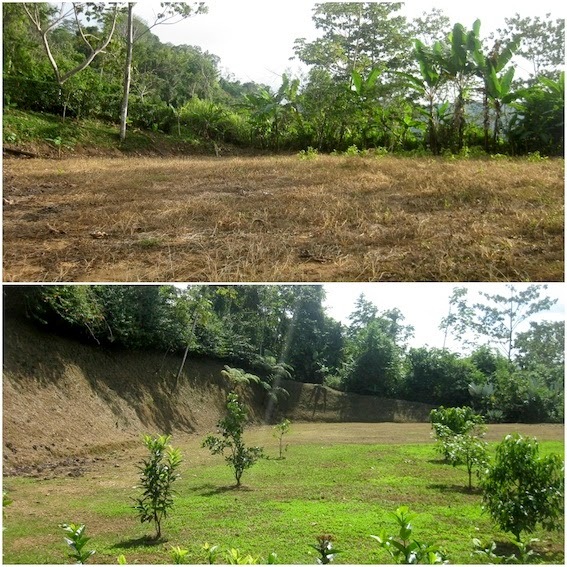 Its action is to kill the tops and it is sometimes described as the chemical hoe. 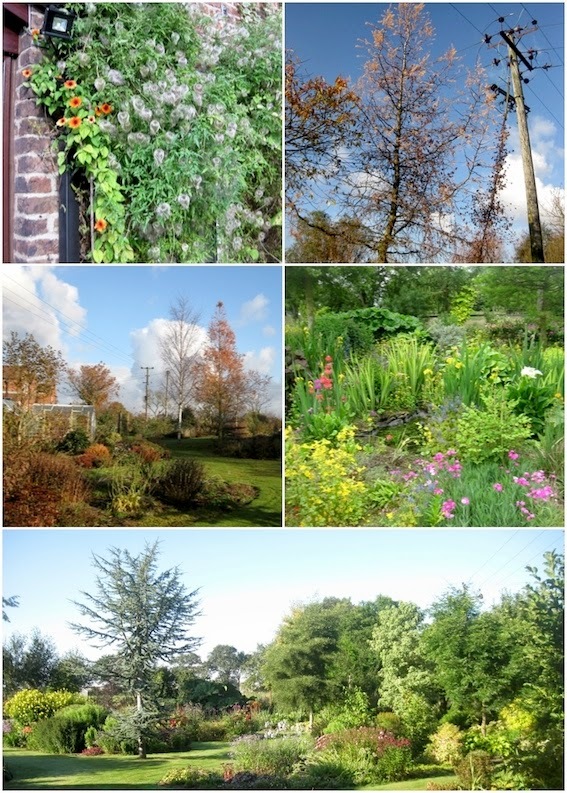 A week of warm sunny weather after spraying a garden in France. Although young weeds will completely die with a single spray in the times given in the above examples, this is not true of established coarse vegetation. If you are very lucky and you are spraying glyphosate onto intact vigorous couch grass for example, you might kill it in one go. Much more likely where gardeners will have previously scrabbled around trying to mechanically remove roots and the herbicide-receptive green leaves have regenerated erratically it will take several applications over a season. Should you have a problem-weed such as ground elder you might have to respray half a dozen times over a couple of years. When I originally sprayed off the weeds in Bolton Percy Cemetery they had been undisturbed for twenty years and amongst all manor of noxious perennial weeds were horseradish roots thicker than your arm and two spits deep. It took me a couple of years before I started seriously planting. Some vegetation is difficult to kill because it is well established, other vegetation does not die because it is herbicide resistant. Difficult weeds such as nettles need a stronger spray but within the regulations. Research seems to show that many weeds are less efficiently killed if the glyphosate is too strong. I have my personal doubts about that! The general pattern is for the tops of tough weeds to die and then for the plant to make new growth from the ground. It is no use zapping small new leaves because they will have insufficient surface area to absorb enough weedkiller. Wait several weeks before you respray. Another reason for initial failure to kill weeds on an overgrown site is that low growing weeds are sheltered by taller vegetation. Some weeds have different patterns of leaf growth and dormancy and may not be receptive to the spray. To the more experienced sprayer such variations are means of gaining selectivity between weeds, wild flowers and garden plants. In what sense is glyphosate quick? As a teenager I gained my love of the soil when forking out couch grass rhizomes in my parents’ new garden. (That is if you discount making mud pies with Christine when I was two). You have never seen such a luxuriant stand of a single weed over the whole of a garden. The previous occupants had rotavated the garden once a year! What a superb method of inadvertent unwanted propagation. In my first year by repeatedly forking-out, I eliminated the couch over a third of the garden. For the rest it was too much for me and I changed my strategy to very frequent deep hoeing of once-dug soil. The idea is that by persistent hoeing, perhaps every nine days, that the underground rhizome’s supply of carbohydrates and buds are exhausted! Both methods work well if you are sufficiently diligent. Some years later my friend Brian acquired his first home and a very weedy garden. I told him about my method of eliminating couch. We moved away and I did not see him for another thirty years. I eventually re-established contact. “Remember your method of eliminating couch”, he declared, “I am still hoeing and it’s still there!”. None gardeners spend years failing to control perennial weed and it is not quick. My parent’s were reluctant weekend gardeners before they moved to the couch garden. At that time I had no interest what-so-ever in matters horticultural! Some weekends they would feel impelled to sort out the garden! They would start at one end - always the same one - and would laboriously work their way round pulling out luxuriant weeds. If their energy levels permitted they would get completely around the garden over the weekend but this was rare. It was such a laborious task they waited as long as possible before starting again. Not only was their work unpleasant and daunting it took many hours and and over the years never ended. How quickly the yet-to-be invented glyphosate would have permanently eliminated perennial weed so that weeding would have become bliss. Another sense in which ‘Roundup’ is quick is in terms of your labour when the man-hours in applying the chemical to a garden are very few compared with traditional weeding. It might take a year or more to get rid of difficult weeds but the actual time spent working, even if you start with an overgrown field, is very small. My own garden is about an acre and is very intricately planted. In Summer it takes me three hours to completely spray round and I might do so every fortnight. At other times of the year it might not be so frequent and in Winter I might get round with my knapsack sprayer in as little as an hour. I have created a rod for my own back in creating a large and intimate garden. Should I ever sell it I will have devalued my property by thousands of pounds. Prospective buyers would look at it and tell me it was a fabulous garden and then walked away. Using their own methods there would not be enough hours in the day to maintain it! For me glyphosate is quick. Most of you will know a year ago when Harry died I took on the planting and maintenance of Cathi’s acre of garden next door. Much of the garden is lawn that Cathi cuts with her ride-on-mower. I have created bigger beds and borders by changing previous tricky shapes to make it easier to mow. A year ago the garden embraced more than its fair share of perennial weeds and for many years yet the soil will be charged with countless weed seeds. I pop over the hedge every fortnight and spend an hour spraying completely all round. The perennial weed has now gone and Cathi’s garden is really lovely this Spring. For me it has been very easy because applying glyphosate is not slow. When I started my blog I wanted to share my experiences of using glyphosate for nye on forty years. Very little reliable information is available for amateurs and if you attend a college special course you will learn much about farming, engineering and regulations but nothing about actually how to use glyphosate in a garden! As a purist I used to always use the word ‘glyphosate’ in my titles because it is the correct chemical name. I have now given in and accept the whole world now uses the word ‘Roundup’ as a generic term. Not only do I get more ‘hits’ for my own personal satisfaction but more gardeners now find me! I do not wish to encourage inexperienced new gardeners to go ‘gung ho’ into using glyphosate in a lovely garden. They will have far too many disasters. Although I have much more to say about glyphosate I have now covered the basic techniques. To use glyphosate safely you need to read all of my glyphosate posts! Unfortunately my early titles do not all always disclose the article’s content. To find relevant posts insert ‘glyphosate’ or for more recent ones ‘roundup’ in my search box at the bottom of the blog. This finds them all! The smaller search box at the top very left hand corner takes you directly to specific articles that Google deems a ‘best match’. There are too many variables for me to say how quickly glyphosate actually kills weeds. Apart from temperature and humidity there are factors such as accuracy of cover, dose, how long glyphosate remains on the leaf before it rains - and sometimes very light rain even enhances its action. also relevant are sturdiness of plant, nature of the leaf surface and plant resistance. As mentioned it will not kill some weeds in one go. In these cases leaves and tops will usually yellow, go brown and die before new growth regenerates from the ground. It does not always work out quite like this. Some weeds might go an awful yellow and suddenly shrug off the herbicide effect, miraculously re-green and start to regrow. Last year I was very grateful of this effect when I carelessly sprayed a couple of gentians having thought they were damned epilobiums. Six months later they flowered as well as their unsprayed companions! The advice on the caption does not apply when there are vigorous very well established perennial weeds when a very large leaf-area is needed for the spray to be effective.